Brownsville CA is a very small town with a lot of heart. Gil and I went to their quilt show last Saturday. It is quite a drive from our home, but it is a great drive to take. It is up in the hills between Oroville and Grass Valley. There is not much there. No antique stores to wander through. There is a bakery that I hear is a wonderful shop, but it is not open on weekends - not even when something like a quilt show is going on. Now come on folks, we would have stopped in to try you out, as I am sure several of the other people who drive that far would. One weekend a year, you ought to try staying open just for us quilt show hounds. There is a small second hand store we wandered around in. All the proceeds of the shop goes to the community volunteer fire department. They earned enough to purchase a big tanker truck last year. We, of course, found a few things we couldn't live without. Gil found a music book that is geared for the piano and the guitar, which are two of his favorites. I found an old wine rack that I hope to use in my studio as a storage unit for my one yard cuts of fabric. I also found some old crocheted doilies that were very, very reasonable. Cheap is probably the better term. One was only 25 cents. I have been collecting them for a while. When I have enough, I will sew them all onto different blocks of fabric and put them into a quilt. It will be a good thing. We also found a set of Sundae glasses for only $1.25 for the four glass set. Pretty good. Only problem is, we never buy ice cream any more. I guess I will have to try putting pudding or Jello in them instead. We did go to the quilt show first, though. Priorities, you know. Again Brownsville is quite small. The quilt show is held in their community center, which is a two story building. The top floor, which is the main floor as you come in out of the parking lot, is where most of the quilts were and the vendors. The room is small and quite crowded. I took one picture from up on the stage, so you can see the size. The other floor is downstairs. There they had some very spicy chili, according to Gil. While I went to a demonstration, he went to check out the chili. There are also more quilts downstairs. There were only two quilt store vendors. 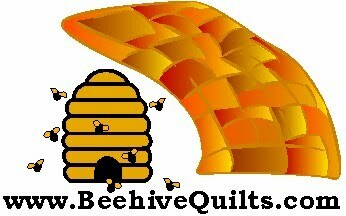 One was the Angel Quilters shop from Lincoln CA. The other one is a shop that is always at that quilt show and I have forgotten their names. They have great panels and good pricing. Angel Quilters has become one of my favorite quilt shops. It is out in the country and carries oodles and oodles of bolts of fabric. I love them because they buy the whole line of fabric or at least enough that you can do a complete quilt without having to look for other fabrics to coordinate with them. I spent quite a bit of time talking with the owner. Well on to the quilts. As you know, I cannot go to a quilt show and not take pictures. Here is a representation of the quilts on display there. Oh they also had a doll show going on, so there are few pictures of them, too. The quilt above is a hard one to make out in the picture. I took a picture of the explanation sheet so you would know what it is. This was my favorite quilt there because of the history of it. This quilt top is made completely out of military uniforms. If you look closely, the pockets, name insignia and buttons were left in, which really adds to the charm of the quilt. Very clever quilt with lasting memories. The above quilt is a quilt that has a designation ribbon on the back stating that it was part of a convention in August of 1897. Beautiful crazy quilt that is in remarkable shape for being as old as it is. The above picture was the first that we saw of the quilts and dolls. Cute display. I love this design. I saw it at the last show I went to, also, and have it on this blog. When I saw this design in an advertisement and it stated it was in a magazine, Elisa and I went to several stores until we found the magazine. Someday quilt for me, for sure. Actually it will be made for my son. I should get to it while it is still on my mind. Needle-turn applique. It had some 7,000 pieces as reported on the information tag. I was amazed that it had that many pieces, but I was more amazed that someone actually took the time to count them all. Beautiful quilt. I love this design. I especially love the vegetable fabric used in the border around the rabbit. Maybe something I could do for all the veggie fat quarters I have purchased over the years and done nothing with. Hmmm. 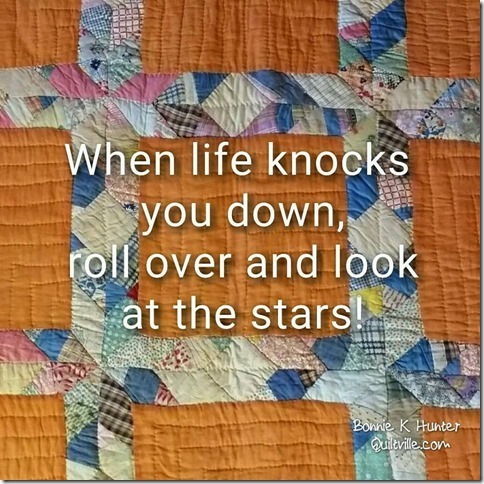 The above quilt is from the featured quilter. I loved the colors she used in this quilt. This quilt is also from the featured artist. I met her and was able to express how much I loved this particular quilt of hers. She said she was with a group that decided they would all do embroidery blocks. She hates doing hand embroidery, so she machine embroidered the blocks. When they were done, she felt they needed a lot more pizazz to them, so she crayon colored the pansies. From a few feet back, it looked like she had needlepointed the flowers. It was really pretty and looked like a lot more work than what she said it was. Very nice. The is one of the dolls that was presented. I guess it is not a doll show but a doll clothes show. When I saw this doll from the front side, I was not sure why they displayed it. It had no head and was just underwear. When I saw it from the back, which was not easily seen, I loved it. It is hard to see in this picture, but it is in fact underwear with a bustle. It is really cute. The above dress was magnificently done. It has beading all over the dress. Just beautiful. Here is a shot from the stage showing most of the main floor of the show. As you can see it is pretty small. It was very well attended, though. I love this show because there is no pretentiousness of the quilters, just lovely quilts. And of course I was not disappointed. There were two Halloween quilts. Both were done by the featured quilter. Both easy to do and very cute. I hope you enjoy seeing the quilts from the shows as much as I love going to the shows and taking the pictures. Going to shows always makes me come home and want to do something creative. Since seeing that show, I have finished a Halloween quilt that was supposed to be a gift for my son and his girl friend and finished my little chick quilt. I just finished binding that quilt this morning. As soon as someone comes home to hold it up so I can get a picture of it, I will post it here for all to see. When I finish here, I am going to make some Christmas pillows. See. I should go to a quilt show every weekend and then I would get more done each week.